There are variety of useful and Intelligent products available in the market at free of cost. One such product is XTB-Traders’s MT4 metatrader 4 platform for Nifty Futures Realtime charts. MT4 Platform is a highly sophisticated automated trading platform. Other than Nifty you can also get Forex, World Indices, US Stocks, Bonds, and Dollar Denominated Commodities(Gold,Silver,Crude,Natural Gas, Sugar,Wheat..etc),T-Notes live charts at free of cost. 2)When launching the program for the first time, you will see a window with the registration form; after you have filled it in, you will automatically get a demo account. very nice post,Mr.Rajendran……please keep it up……. Sir I saw meta trader 5, I already using meta trader 4 for nifty future, whether any benefit i will get if i could use meta trader 5 in demo account? Thanks for the new info. I am already using Broco and GCI4 softwares for trading Commodities. Pl let me know whenter this MT4 alone will do both for Nifty and Comodities ? also let me know whether nifty charts updating immeidiately while market moving or takes some time to update on chart ? @vishnu : Nifty charts are realtime in XTB trader. Also i havent seen any MT4 platform with nifty and mcx commodities combined. There will be a post in marketcalls if any such software is made in this world. Dear Rajendran, Thanks for the info. Yes it is realtime I hve observed but a slight time delay ie; becaz of MT4 server and Nse server info exchange. But it is really good to read the market trend. Also international commodities also good. As your earlier post I hv been using GCI and Broco also good. Thanks for the info. keep posting such useful info. Sir, i am your follower. thanks a lot for sharing us your valuable knowledge and time. mt4 i could view reliance, reliance communication, infosys, wipro, SBI etc etc but in xtb i couldnot view that. how to get those in xtb too like mt4? awaiting your valuable reply. I have downloaded the demo version of XTB Trader, but it is showing no connection. How to activate the connection. Can you please help by advising the same. Can you please send me an email or post, how to get US Stocks on Metatrader Platform. sir , The meta trader 5 of brocompany used to display all the stocks in cash and futures traded in the national stock exchange of india. But now they have stopped the technical charts. The meta trader 5 is not updating. Kindly help in this matter. Very informative post Rajendra. The best thing about your post is incorporation of an actual MT4 platform & the simplest tips given to install it. sir, can u provide me the old exe of XTB TRADER MT4 . sir am not able to view realtime chart with metatrader xtb for nifty it worked for one day and now it is not can u pls help.. 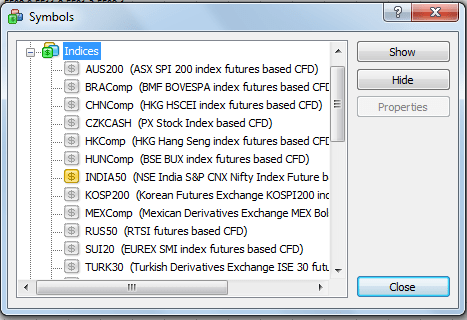 Does BFD trader or XTB trader or BMF Metatrader demo version working at present? Do you know any other vendor providing same service supporting Metatrader ? I have used demo version of First charting but they do not provide continuos charts of longer duration for both MCX and spot commodity. Your company is also channel partner with first charting software. Can you solve the problems of first charting software in your software? i wana data for metatrader 4 i have software called varengold meta trader … its possible ? you give me nifty mt-4 sofver. pls provide the link for xtb trader -- MT4 with NSE symbols. thanks in advance. please provide the link for xtb trader — MT4 with NSE. thanks in advance. This is old post. Is it still working? I am not able to do it. Please advise. Thanks much for this info very useful really. also request please confirm if we could get to see BANKNIFTY in any MT4/5 platform, thanks a ton! How to add NSE & MCX Stocks in MT5. Sir how to download XTB-Trader MT4 Trading Software from your link : https://www.xtb.com/en . Because there is no download options given. Only two options which are DEMO and CREATE ACCOUNT is given at the top, what should I do???? Sir I tried on clicking at DEMO the site replied it is not applicable in your countary, what should I do??????? Please reply me soon in my inbox. Try changing the country and get the demo as simple as that. hello sir …..i am following this for many months, but i still not able to enabled chart of nse stocks on XTB mt4 platform ……..”Waiting for update”on chart screen showing . i can see whole stock list of NSE , but this issue remains .plse help me to sort out this ….Thank u very much for your effort to help others. How to get bank nifty symbol in MT4?